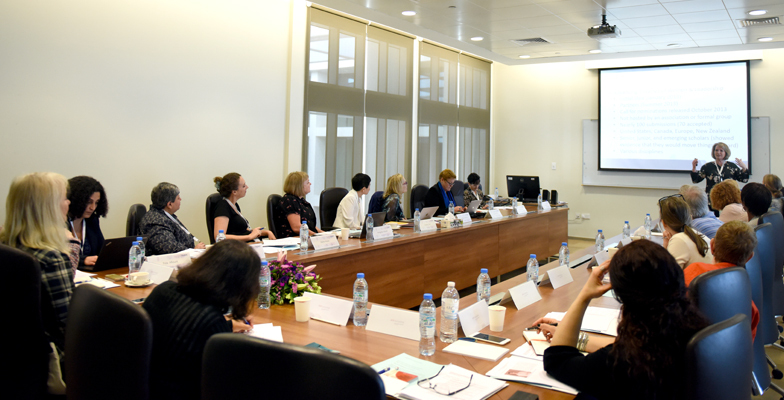 Women thought leaders gathered at American University of Sharjah (AUS) to participate in ThinkTank: Introduction to Women in Leadership (MENA), which began today, March 18, 2019. The ThinkTank, which is a multidisciplinary group of 25 regional and international scholars, aims to create discussions specific to women in organizations in the MENA region. The objectives of the two-day forum are to develop a comprehensive research strategy for the examination of issues facing women in organizations across the MENA region and connecting researchers, research centers and organizations to collaborate on studies. Dr. Charlotte Karam from the American University of Beirut; Dr. Susan Madsen from Utah Valley University; Dr. Fida Afiouni from American University of Beirut; and Professor Susan Vinnicombe from Cranfield University are the designated ThinkTank leaders. Sponsored by the AUS School of Business Administration (SBA), the ThinkTank has been organized by Drs. Linzi Kemp and Savita Kumra, Associate Professors of Management at SBA. “We wanted to organize an event in the region that would make a difference to research and scholarship in this extremely important area and so we invited top scholars who have expertise to bring to the ThinkTank. Some are here because of their regional understanding, some for their understanding of gender as an issue in organizations and some are experts in methodology. It was very important for us to bring together this elite and highly knowledgeable group to begin formulating a research agenda. The ThinkTank concludes tomorrow, March 19.